"We hold these Truths to be self-evident, that all Men are created equal, that they are endowed by their Creator with certain unalienable Rights, that among these are Life, Liberty, and the pursuit of Happiness. That to secure these rights, Governments are instituted among Men, deriving their just Powers from the Consent of the Governed." - Declaration of Independence, July 4, 1776. In July 1776, fighting between the American colonists and the British forces had been going on for nearly a year. On July 2, the Second Continental Congress voted to declare independence. On July 4, they agreed to the final wording of the Declaration of Independence, the principal author of which was Thomas Jefferson. The Continental Congress adopted the Declaration of Independence "in the morning of a bright, sunny, but cool Philadelphia day." John Dunlap from Ireland (1747-1812),one of the most successful printers of his era, was the printer of the first copies of the Declaration of Independence. Dunlap printed the Declaration of Independence, prints now called the "Dunlap Broadsides." Twenty-four copies are known to exist, two of which are in the Library of Congress. One of these was George Washington's personal copy. The original Declaration of Independence document approved July 4, 1776 has been lost. 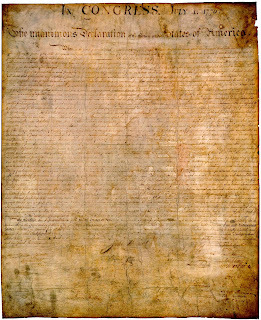 What is exhibited in the Rotunda for the Charters of Freedom in Washington, D.C. is a copy. It has faded badly, largely because of poor preservation techniques during the 19th century. "The Declaration of Independence: A Brief History." Boyd, Julian P. and Gerard W. Gewalt, Editors. The Declaration of Independence: The Evolution of a Text. Library of Congress/Thomas Jefferson Memorial Foundation, Inc.; 1st edition (June 1, 1999). Maier, Pauline. American Scripture: Making the Declaration of Independence. Vintage Books (May 26, 1998).